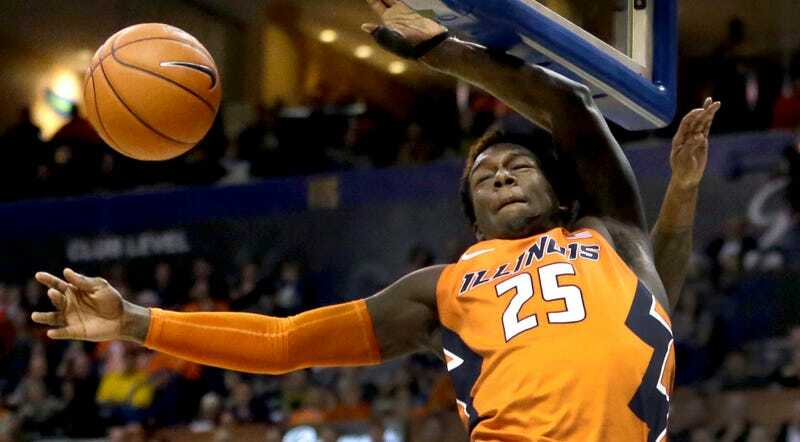 Fighting Illini junior guard Kendrick Nunn was charged today with one count of domestic battery after authorities in Champaign County say he struck a woman in the head, the News-Gazette is reporting. Nunn’s arrest is the fourth one of an Illini basketball player since August, and the second charged with domestic battery within the past seven days, according to Shannon Ryan of the Chicago Tribune. According to Champaign County jail records, Nunn was booked today a little bit before 5:45 p.m. Central Time. He’s being held on a $5,000 bond on one charge of domestic battery. He has a court date scheduled for tomorrow. First Assistant State’s Attorney Steve Ziegler told the News-Gazette that police were called Wednesday to a home by neighbors who said they head a loud argument with a woman yelling “get off me” and a man yelling “give me my money.” When officers got there, Nunn and the woman who was there said “nothing physical happened,” Ziegler said. Some time later—the News-Gazette report didn’t specify exactly how much time had passed—the woman called police and said something did happen. “She said they were arguing about their relationship and whether or not she owed him money and at some point he did push her and strike her in the back of the head. During the physical part of the altercation is when Champaign police showed up,” Ziegler said. Ziegler said police reported seeing red marks on her neck and shoulder. They took photos. Ziegler said the charges allege he struck her about the head, pushed her to the floor and held her by the neck and that in doing so, the contact was of an “insulting or provoking” nature. Nunn started 25 of 28 games this season, averaging 35 minutes, 15.5 points, and 5.0 rebounds per game.